Improvements in materials technology have made a significant impact on sporting performance in recent years. Advanced materials and novel processing methods have enabled the development of new types of equipment with enhanced properties, as well as improving the overall design of sporting goods. The interdependence between material technology and design, and its impact on many of the most popular sports, is reviewed in this book. Materials in sports equipment presents the latest research, from a distinguished panel of international contributors, into the chemical structure and composition, microstructure and material processing of the various materials used in a wide range of sports. The relationship between performance and design is examined in detail for each sport covered. Part one concentrates on the general use of materials in sports. 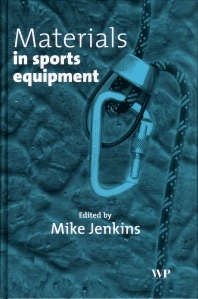 Here, the reader is given a broad insight into the overall influence of materials in sports, and the significance of material processing and design. Part two focuses on showing how individual sports have benefited from recent improvements in material technology. It also analyses the way in which improvements in our understanding of biomechanics and the engineering aspects of sports equipment performance have influenced materials and design. Sports whose equipment is considered in detail include: golf, tennis, cycling, mountaineering, skiing, cricket and paralympic sports. The overall aim of the book is to make the reader aware of the interaction between the type of material, its selection, processing and surface treatment, and show how this process underpins the performance of the final sporting product. It is essential reading for all materials scientists and researchers working in this rapidly developing field. Part 1 General uses: Foam protection in sport; Performance of sports surfaces; Running shoe materials; Balls and ballistics. Part 2 Particular sports: Materials in golf; Surface engineering in sport; Materials and tennis strings; Materials and tennis rackets; Materials and bicycles; Materials in mountaineering; Materials in skiing; Materials in cricket; Materials used in paralympic sports.